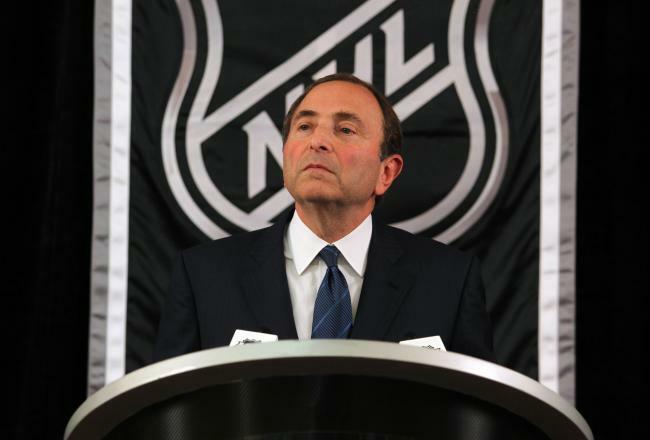 NHL Commissioner Gary Bettman has been known to say some wacky things. And there can be the perception that Bettman is in an ivory tower, unaware of his surroundings. This perception came back to bite him when the Commish met with reporters on Friday to discuss the state of the league and other matters. His head-scratching comments regarding fans taunting the Anaheim Ducks’ Corey Perry with “Katy Perry!” chants not being sexist are a prime example. Also during that Q&A session with reporters, Bettman was asked about tanking and once again, his responses came out like someone in denial. When asked if teams tank to get a better chance in the Draft Lottery, Bettman sounded like Captain Louis Renault being shocked, shocked about gambling in Casablanca when attempting to trump up a charge. “I don’t believe there’s tanking,” Bettman said. “I think it’s more perceptional. I think that perception gets driven more by commentary than it does in reality. If teams don’t lose on purpose, then why was the NHL compelled to make adjustments to its draft-lottery process? So Bettman is saying tanking is really a media thing mostly driven by commentary? To be fair, teams at the bottom were separated by 17 points, but Buffalo did appear it was doing its best to be at very bottom. Fans were cheering the Sabres when they were losing at home. That wasn’t just a media creation. The ivory tower at NHL headquarters must be really insulated.